@davidleary @BlakeTOliver another case for unlimited PTO: female retention. I use 1/3 of my PTO on vacation, 1/3 on my sick kids 😷, 1/3 I hoard so I have paid maternity leave. Women have different PTO needs then men, when can we recognize that and come up with a solution? Why we are calling for the definition of the word ‘accountant’ to be changed — Xero — Xero is calling for The Oxford English Dictionary to "change its out of date definition of the word ‘accountant’ to something that truly reflects what it means to be an accountant in 2019." Expensify This — Expensify — You have to see it to believe it. Expensify is out with a rap video about expense reports in advance of their big Super Bowl ad. Apparently EY’s ‘Program Mercury’ Is Hot Garbage and Some Folks Are Understandably Upset About It — Going Concern — Critics of EY technology have expressed concern that their submitted expenses aren't being paid, and blame EY's Program Mercury. Square's Newest Product Is Genius — Motley Fool — The Square Card, a free business debit Mastercard for Square merchants, gives its users access to funds as soon as they make a sale through their Square card reader. Intuit donates $2 million to U.S. Federal workers — Enterprise Times — As part of its Corporate Social Responsibility program, Intuit has announced the donation of $2 million to food banks supporting federal workers in the US. Fishbowl Adds Marijuana Tracking and Inventory Management — CPA Practice Advisor — Fishbowl now meets the tracking and inventory management needs of people and companies authorized to provide legal cannabis services and products among the increasing number of states who have legalized marijuana for medical or recreational use. Avalara acquires alcohol compliance services provider — Accounting Today — Avalara has acquired the operational assets of Compli, which provides compliance services, technology, and software to producers, distributors, and importers of alcoholic beverages in the United States. Sage sells U.S. Payroll Solutions arm — Accounting Today — Sage, a U.K.-based provider of enterprise resource planning software, has sold its U.S.-based payroll outsourcing business for $100 million. The buyer is workforce management software maker iSolved, a portfolio company of tech-focused private equity firm Accel-KKR. Transforming the Government Shutdown into New Tax Business — Insightful Accountant — Is this year’s government shutdown one big hassle or one big opportunity? Well, probably a little of both. Find out how to turn it into an advantage for your tax firm. Keeping the CMA Relevant — Strategic Finance Magazine — The IMA says that, given the changing nature of the profession, the CMA exam should cover data analytics in more depth and also cover the digitization of the finance value chain. Why CPA Candidate Numbers Have Decreased: Part 2 — AccountingWEB — Stephanie Ng continues to explore decreasing CPA candidate numbers. The Big Tech Canary In The Faster Payments Coal Mine — PYMNTS — Karen Webster said the canary in the coalmine isn't about making payments move faster so much as sidestepping the "legacy incumbents" FIN says stand in the way. 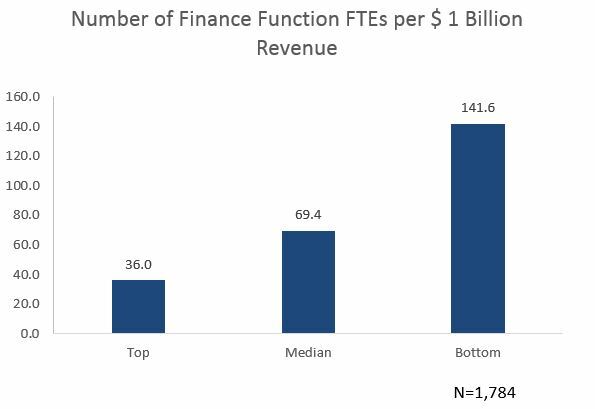 Metric of the Month: Finance FTEs Per $1B in Revenue — CFO — More finance organizations are finding that it’s better to have a smaller, highly strategic team than an army of workers focused on transactional activity.